There's so many threads with Giacchino love and ZImmer love on this forum I thought it wouldn't be out of line to start a Desplat thread. The funny thing about Desplat is how his music has grown on me. When I first heard his stuff, it was while reviewing Hostage for FSM years back. I thought he had a good style but perhaps a little melodramatic for that film. I said at the time that his music would have fit a comic book film very well though. The Painted Veil was the next score I heard and I became more interested but, like a few here, I was left a little cold by his music- like I enjoyed it on a technical cerebral level but couldn't "feel" it. Then The Curious Case of Benjamin Button came out and I was instantly transfixed by it. All of the quirky elements that initially didn't resound with me did. I loved his use of the flute section (something I also enjoy on Birth), the long themes, the evolving harmonies that recall Satie, Debussy and Saint Saens, and the exquisite sense of orchestral coloration. Even his use of the rhythm from the opening motif from Rachmaninov's 1st Symphony (some would ascribe as Horner's "danger motif") wasn't stale or chliche'd because he had the sense to alter the intervalic relationships between notes. Then came New Moon which at first I didn't care for because the main theme was a little sappy and too basic, especially for a composer who had exhibited a high degree of musicality and breadth of styles up to then. But I kept listening and as the score unfolds, the latter cues especially give way to some amazing, energetic action writing, the likes I hadn't heard from Desplat, even on things like Largo Winch. I also really enjoy Lust Caution. The main theme for that is truly moving to me. Something about how he constructs his lines, balances them with their harmonies, and applies a clear sense of orchestration- he also uses countermelodies, something that I haven't heard in ages. This is exactly how I feel. Same story as you, too, though with different scores: initially I was a bit lukewarm with Birth (and I'm not too fond of Benjamin Button, either), but then I discovered scores like Girl with a Pearl Earring, Un héros très discret, Les milles, Hostage, Lust, Caution, The Queen, The Ghost Writer, etc. The turning point was a concert by him I attended a year ago. My first exposure to Desplat was through The Golden Compass. It has some wonderful moments early on, but I was (and still am) disappointed that the second half is just a lot of noise. Next I got Benjamin Button, and I loved it. It's my favorite score of 2008 (and yes, that's the year KotCS came out). I agree about his use of the flute section - not a lot of composers seem to use woodwinds these days, so hearing flutes was very refreshing (and the music itself is gorgeous). Then I got Fantastic Mr. Fox. It's a great score as far as versatility goes, but I must admit I don't get as much enjoyment from it as I do Benjamin Button. Still a very good effort. I look forward to Harry Potter 7. I think Desplat was a good choice given that Williams was unwilling. I've been on the record about Desplat for a while now- I didn't really get the love for Girl with a pearl Earring initially (I adore it now). I think it did eventually grow on me, and I was kinda interested in Hostage and Birth, but it was The Queen the hooked me. Seeing how the score worked in the film, I was in awe. Not because the music is overwhelmingly striking- but because Desplat absolutely nailed a tone in his score that I felt was the work that only the most talented and imaginative of film-composers could achieve. And I did (and do) love the music. Ever since then, there's been an ebb and flow, some more, some less. I don't feel like he's done anything to capture my imagination quite as strongly as The Queen did, but I still feel like he's working on a whole other level, like Powell is in a different way. I don't feel like yet again detailing exactly what qualities he has...but, suffice it to say- even though I haven't been overwhelmed by him in a while, I am entirely confident that he's one of the best there is, and sooner or later, he's gonna find the perfect project and blow my mind (though he has, in small ways, with The Golden Compass). I'm always curious to listen to any new Desplat score and nowadays he is by far one of the most interesting composers, but I worry he might be writing to many scores each year. Desplat is quickly becoming my second favorite living film composer. Like Morlock, I was struck by how his score for The Queen so beautifully enhanced and fit the film. It may be the top score of the decade in that regard. The Painted Veil, The Curious Case of Benjamin Button, and Lust,Caution are all beautiful and Fantastic Mr. Fox is fun. Can't wait to hear what he does in the future and in particular with the Harry Potter franchise. yeah me too. I like his harmonies.They don't sound generic(Debney,Silvestri} or manufactured (RCP). Honestly, I've only listened to Golden Compass and I was fairly unimpressed. What is highly recommended? I would love to have any desire to buy a new Harry Potter soundtrack. Golden Compass is the one I didn't like at all (except Sky Ferry). It's actually the score that makes me question his ability to score big epic films (like Harry Potter) especially action scenes. I agree on the action music (but which french composer ever could do such stuff? ), but i found that Desplat handled the mysterious tone brilliantly. Williams couldn't have done it better. I honestly haven't listened to any of his scores outside of their films, sadly. And the only score of his that I know I've heard in the film is Benjamin Button, which didn't really stand out to me as anything particularly interesting at the time. Still, I'd like to give the guy a shot at some point. Maybe his Potter score(s) will finally get me interested in his work. And the only score of his that I know I've heard in the film is Benjamin Button, which didn't really stand out to me as anything particularly interesting at the time. I think the action writing on The Golden Compass is breathtaking, and by far of the most exciting stuff of the past decade. I'll admit it takes a few listens first, as I myself tend not to pay attention all that much when I listen to something random (which it was back then) for the first time. This score's pretty much the one that made me pay attention. He's surely one of the few really interesting and peculiar voices that came out of film music in recent years. I initially didn't like Desplat when I first heard his music. I think it was Hostage or one of the other scores he did that year, and was very unimpressed. I don't think I bothered with him at all until The Curious Case Of Benjamin Button. That score sold me onto his style. Then I went back a little and listened to Girl With A Pearl Earring and The Painted Veil. I still wasn't overly impressed, but they were good. Then came New Moon. I first heard it while waiting for the theater to get out, and when the theme kicked in I was shocked by how good it was. Fantastic Mr. Fox is what sealed it for me, though. His best score, and my favorite score from last year (Yes, I like it more than Up). When I first heard "Bean's Secret Cider Cellar," it blew me away. And yes, The Ghost Writer is pretty fantastic too. I think it all depends on the projects he does, because there are several scores in between the ones I love that don't do anything for me. Like many people here I wasn't as interested at first in his music. I always liked his Syriana score. It's not mentioned frequently when people talk about Desplat, but the score was very effective in the film and quite sublime. Yes, I am a bit worried about him staying too much in his comfort zone (waltzes thing), but he proved himself to be quite versatile so far. I this is the key to longevity, I think. I doubt his HP score will convince many people. He can pull it off, obviously but it will proabably end like The Golden Compass. Too clinical-sounding for most people. I love his work so far, especially The Queen. Unfortunately, Fantastic Mr. Fox is the only one I have trouble getting into. Maybe I should listen to the promo score, as I didn't like the songs on the album so it may have affected my thoughts on the score. My first remembered exposure was hearing Kitty's Theme from The Painted Veil years ago. I believe it was part of an amateur 'best of film music 2006' compilation I listened to. I thought it was just wonderful, but I never really thought to further look into either the rest of the score or the composer. He came back onto my radar with The Golden Compass, which I believe I gave a listen to but didn't think much of. Then I heard Benjamin Button. There was an official Warner Brothers website that was streaming the album in full. It sounded nice, so I acquired it and it's really grown on me. Earlier this year I was deciding on a birthday present for a sister, and as the movie was a recent favorite of her's I looked into the album for Mr. Magorium's Wonder Emporium. I do understand that the score was co-written with Aaron Zigman, but I believe in the booklet Desplat mentions having written the movie's themes. In any case, while still not in my top favorites he is definitely a composer I want to become more familiar with. Deathly Hallows is much anticipated. EDIT: Just reread Desplat's note on Magorium again and except for mentioning the piano 'hook' he wrote for Portman's character it isn't elaborated on who was precisely responsible for what. He mentions Zigman having written some of his own themes as well as being responsible for the orchestration. He was also the one who asked to bring Zigman onto the film. I am becoming quite the fan of Desplat, I remember watching the film 'The Queen' without knowing who had scored it at the time and being absolutely sucked in by the music. As its already been stated, Desplat got the tone of the score so right I'm unsure how anyone could have done it. I find the film has a very unique feel, its not a romanticised depiction as anything with the royal family as subject can become, it almost feels like a documentary, because the direction and acting is so understated and somehow Desplat managed to create a beautiful score that resonated so much with me, while never over powering of over emoting a single thing. I love this score. Golden Compass i am also quite a fan of, but i agree that the later half of the score is very heavy (or 'noisy') and whenever i give it a listen i seem to switch scores around track 12. However I love his theme for Dust and I really think his nailed the quieter mysterious parts of the score. I wish this film had turned out better as I love love LOVE the books. I think its interesting that someone said the score feels clinical, because to a point I actually think the feel of the world around Lyra in Pullman's universe feels very clinical, particularly where the adult characters are concerned. Everyone is cold and calculating (with a couple of obvious exceptions) and perhaps the score captured that. Boy, Desplat loves those dark scarves doesn't he? On the topic at hand, I really love the man's work. His work on The Golden Compass was exquisite, and New Moon hooked me from the get-go. And from the samples on Amazon, I think Deathly Hallows is going to be another slam dunk on his resume. I would like him to do a Bond score. These samples sound like he could pull it off quite well. One thing that I don't like about Desplat is, that he looks just SOOOO french.. don't get me wrong, I like the french, but the way he dresses, moves, etc... he looks like he is trying to hard.. he looks more like an over-the-top persiflage of what the world imagines a french artist looks like. come on, knock it of - will ya! I thought it was funny in his interview, from the Spartacus tribute set, that he was the one to talk about how beautiful Jean Simmons was and how the love theme was like a perfume that lingered in the room even after her character left the scene. I was like "Yep, he's French alright." I like the pink necktie he wears on the Deathly Hallows featurette. I find his scores incredibly bland. Even then, he's probably one of the more interesting composers in Hollywood. EDIT: Got it, it's Francois Couperin's Les Barricades Mysteriuses. New piece to me, but I think it's a favorite now! I don't think it's Desplat, but I have not identified the piece as yet. Hmm... I have The Queen and Syriana sitting in my Amazon cart, but have not yet pulled the trigger. Absolutely loved Deathly Hallows, Part 1 - probably my favorite score last year. I also have Golden Compass and New Moon, but those two have not had enough time to sink in. Absolutely loved Deathly Hallows, Part 1 - probably my favorite score last year. I heard it has no themes. Is that true? Desplat establishes a theme for the Death Eaters that makes a few appearances (first in "Snape to Malfoy Manor"). But in general, it's more mood-setting material than big thematic statements, quite different from Williams' work on the series. I was caught off-guard by the way Desplat used the orchestra. There was something just so "fresh" about it for me. Spider-man has a theme. It's just not very special. You can really tell who cut their teeth on John Williams' mickey mousing style of film scoring when they lambaste a really good score for its apparent lack of themes, and don't wanna think outside the box. Mickey Mousing? 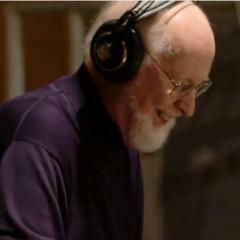 John Williams? What are you talking about? What are you not understanding? There are themes, and I would even go so far as to say they're memorable, but more in the sense that they're "easily remembered" rather than "worth remembering". They're very present, and are prominently featured throughout the soundtrack, but the real interest in that score is most definitely in the creative and effective orchestrations, not the melodies. Boo! Wasn't he finally arrested though?